Dosbat: What is interesting about maximum extent? 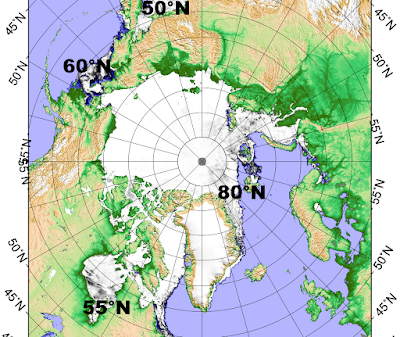 Arctic sea ice has a seasonal cycle, when the sun starts to set in September for the long Arctic winter night the ice starts to grow, it continues to extend outwards until the sun starts to rise in March. After that, through spring and summer the ice retreats and extent drops. This means that about this time of the year the maximum is set. This year the maximum looked like it might have been set in late February, but after that peak growth continued and currently the maximum is on 21 March at 14.576 million (M) kmsq extent. Will this stand? Maybe. I find the most interesting thing is to step back from one year, which is just part of an ongoing trend and look at the longer term pattern of loss around the maximum. 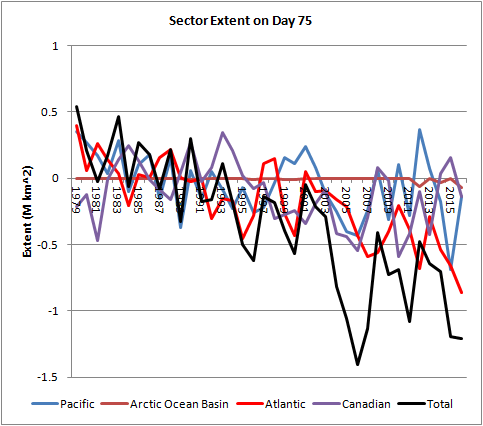 The largest single contributor to the decline, and the area with the strongest decline is the Atlantic sector (sectors are shown here). 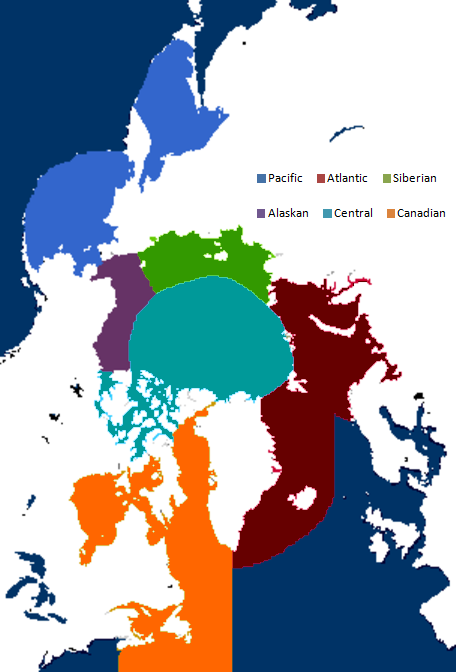 The Atlantic sector is comprised of the Kara, Barents, and Greenland Seas, their individual behaviour is shown below. 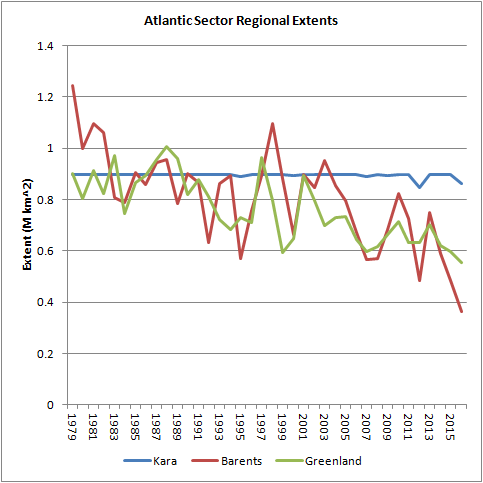 So the decline comes equally from the Barents and Greenland Seas. Stepping back again to look at all sea ice in the Northern Hemisphere, I have calculated the linear trends of loss for all sectors (using Excel's Slope function). 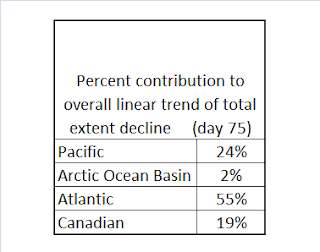 The advantage of this is that these trends sum to equal the trend of loss for all sectors combined, so I can express the percentage contribution of loss trends for sectors to the overall loss trend for all sectors combined (Northern Hemisphere Sea Ice). So about half of the loss trend is driven by the loss trend in the Atlantic sector, with a quarter from the Pacific sector and a fifth from the Canadian sector. This pattern of greater loss in the Atlantic sector is reflected by a peculiarity of the pattern of extent across the Northern Hemisphere. The ice edge in the Pacific and Candian sectors is at around 50 to 60°N, yet in the Atlantic sector it is far further north at 80°N. 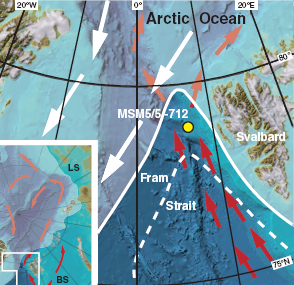 In Spielhagen, et al 2011 "Enhanced Modern Heat Transfer to the Arctic by Warm Atlantic Water", the authors find that current advection of heat through the Fram Strait (between Svalbard and Greenland) is exceptional in the context of the last 2000 years. They use a site in the Fram Strait and use foraminiferal plankton from sediment cores as a proxy for temperature. The site is shown here. And the increase in summer temperature is seen here. Unfortunately this is for summer temperatures, plankton at 50m depth don't thrive under ice, however the cause of the temperature increase is Anthropogenic Global Warming, and this doesn't just act in the summer. So it is reasonable to presume North Atlantic ocean warming in the winter. Hello, it is a great post explaining things very clearly. However for the last graph it seems the years are missing, is it possible to add them? Sorry about that Géd, fixed now. So do you think a record summer minimum is likely? Hi Chris, very informative post as usual. I'm wondering about the interaction between timing and amplitude of maximum. A low maximum means more heat escaping from open water this time of year. Seems like the opposing effect of a late maximum would be secondary. Later in the season the effect flips as insolation overtakes outward heat radiation. But that imbalance, in turn, depends on the latitude of the ice edge (relative to average climatology) as peak insolation moves northwards. I don't know, I'll probably say something about this in my March PIOMAS early this month. Thanks, as long as it's interesting and useful I'm doing something right. I looked at the issue of impact of maximum and minimum last year. As for the mechanisms - sorry I'm too tired to think about that right now, haven't recovered from the working week yet. 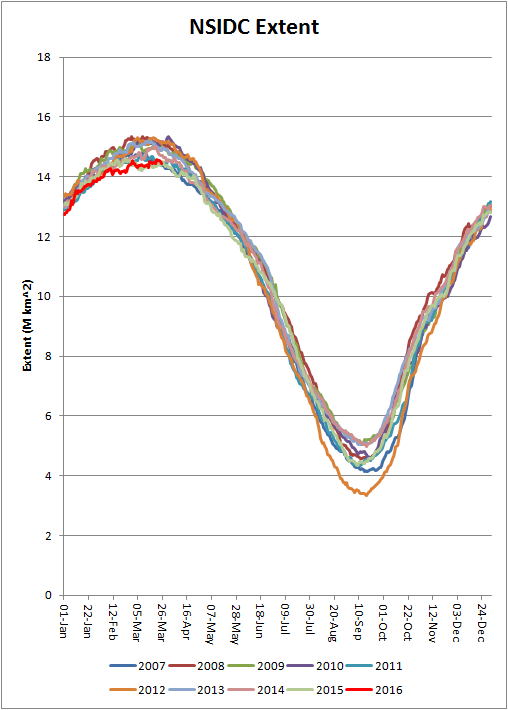 Having just been reviewing the state of PIOMAS volume, February volume was 16.48 for the Arctic Ocean, which is similar to 2011 to 2014, at max in April those years were about 19.3 to 19.5. For that sort of April volume I'd be predicting 4.1 to 5.3 million kmsq - i.e. a typical post 2007 year. As in 2012 and 2007 (the only years after 2007 in which my hindcasts fails) it would take extremely good melt weather to precipitate a new record. Sorry this is OT but do you have any idea whats happening with the CT ice area recently? Are those two big spikes measurement artifact or 'real'? Is there some large ice movement going on now? They look very unusual? 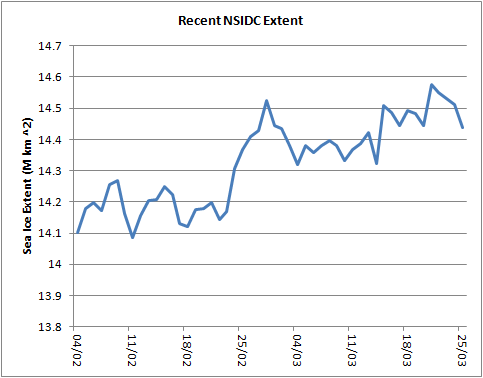 Sea ice index is carrying a warning about the SSMIS data used for that index. Could this be the issue? North Atlantic Winter temperatures are increasing at 0.04 degrees per year since 1948. Thats an increase of over 2.5 degrees. According to the trend, -23.5 > -21.0. This year was -18.8 breaking the previous record high by 0.6 degrees. That's 10 percent of the total range since 1948 or to put it another way an additional 0.5 std devs above the previous record, going from 2.4 std devs to 2.9 std devs. Will this year be a record? Highly likely. Looking forward to seeing your ice thickness measures for April Piomas.